At the recently concluded JEC show, held from 25-27 June in Singapore, exhibitors were in favour of the Asian market. With more than 300 participating firms and 5,200 visitors to the show this year, the exhibition is considered as the only event in the APAC region where a majority of the key players in the global composites industry value chain converge. US-based ASC Process Systems anchors in the exponential growth of the aerospace sector, having 80% of its customers in this sector. Paul Parsons, Managing Director, told PRA that emerging markets are in Asia. “Here at JEC, we have a number of potential customers from Singapore, Malaysia., Indonesia, Thailand, so we are here to meet with existing customers and to develop any new leads for new projects. In Asia, our China office covers the Asian market. There are lots Chinese suppliers here but we are looking for Indian visitors and those from Southeast Asia, from Malaysia, Thailand and Vietnam which is an emerging market. The Japanese and US markets are already established markets so we are really looking at mostly the Southeast Asian markets,” he emphasised. Parsons explained that their company is engaged in thermo process engineering with its autoclaves, which he likened to a pressurised oven or cooker. “What we do is basically more of heating and cooling of composites, which is curing the resins systems within time and temperature limits while controlling that process.” For composites in aerospace, he said that control in the heating and cooling is required to come up with a product that is strong. 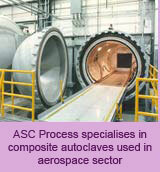 “Aerospace composites make use of autoclave to construct parts that are under stress. Autoclave does heating and cooling under pressure. As the temperature rises and the resin becomes liquid, the autoclave process releases the air or gas bubbles to produce a product that is stronger, ”he said. With the advent of the new Boeing 787 Dreamliner and A350 Airbus aircraft, which contain a higher content of composites, the requirement for composites has increased dramatically along with the requirement for the processing of such composites, he added. Meanwhile, another JEC participant, the Association of Aerospace Industries of Singapore (AAIS), a non-profit industry body dedicated to promoting competitiveness within Singapore's aerospace industries, also finds the sector turning upbeat, gauging foremost from its growing membership, which it expects to increase count from the current 114 member companies to 130 companies in the near term, according to Thomas Kennedy, Interim Chief Executive of AAIS. German company, Suragus GmbH, also a JEC participant and innovation awardee in the NDT category for its non-destructive test carbon fibre products (dry fabrics and composites) without coupling media, uses electrical conductivity in the carbon fibre. “We call ourselves innovative NDT because the method is not like any other NDTs,” said Richard Kupke, Project Manager at Suragus. “We use these attributes to characterise fabrics as well as carbon fibre plastics, so that gives us the unique advantage to already start early in the production chain to analyse whether the quality of the product is acceptable or not. Our method infuses an electro magnetic field in the material and then measures the response from the material and generates some images, which shows the distribution of the fibres and if there are gaps, misalignments or minor distortions,” he explained. Suragus’s distributor, Gaia Science, has offices in Singapore, Malaysia and Indonesia. First-time JEC exhibitor, Mitsubishi Engineering - Plastics Corp (MEP) showcased its continuous fibre-reinforced thermoplastics at the show. The Reny Tape, a proprietary moulding compound based on mainly polyamide MXD6 that has been reinforced with glass fibre, carbon fibre or special minerals, could be applied as structural parts or a metal substitute for several applications, such as automotive, electronic/electrical, construction, machinery and sporting goods. Kazunobu Maruo, Marketing Manager for MEP said that their participation at the JEC was to meet potential customers, moreover target automotive markets based in Europe, Japan and the US. JEC also put the spotlight on the energy and defence sectors that find applications for composites. Australia-based Victorian Centre for Advanced Materials Manufacturing (VCAMM), which also won an award under Defence and Protection Category for its high curvature armour systems,was promoting Carbon Nexus, an R&D facility for carbon fibre materials, at the show. Brad Dunstan, CEO for VCAMM and adjunct professor for Carbon Nexus at Deakin University in Australia, said that the US$34 million facility is dedicated to enhance Australia’s capacity in the carbon fibre industry through fibre science, materials and manufacturing research According to the company website, the centre is incorporating a 20-tonne/year Carbon Fibre Pilot Line, as well as a single tow research line , along with fully-fitted modern research laboratories. 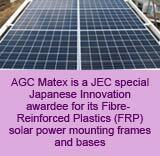 JEC’s special Japanese Innovation awardee, AGC Matex, was awarded for its fibre-reinforced plastic (FRP) solar power mounting frames and bases. Koshiro Hayashi, Managing Director of AGC Matex, said that the firm is strengthening its presence in the Southeast Asian markets, having already established a base in Japan as well as in Thailand where the company also has an office and a factory. The company makes tubes to protect power cable and optic fibre lines. This Japan-developed technology is made using its pultruded FRP material PLALLOY. “Our products’ core characteristics are strength, light weight and durability, “ said Hayashi, adding that while the company is optimistic of the overall market prospects for its products, it is currently focusing on Japan, Vietnam and Thailand as its main markets.